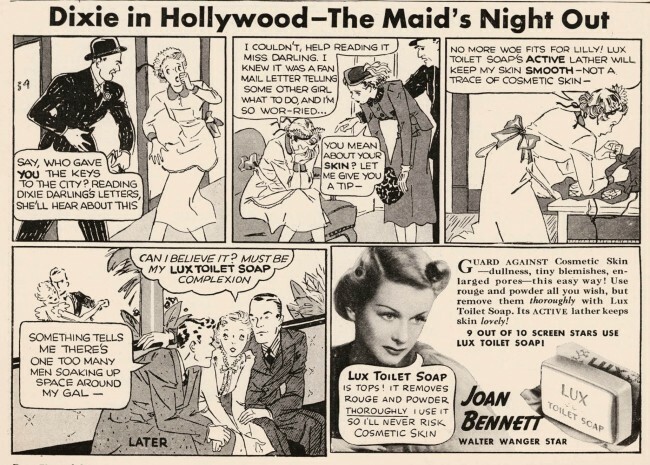 ONE thing you’ll find when looking through magazines from the 1930s and 40s is an amazing array of soap and constipation adverts. It’s as if the world was ravaged by body odor and irregularity. Ad after ad proclaims the wonders of this fantastical object called “soap” – lives are changed by its tremendous power to rid even the smelliest among us of their funk. But that was only half the battle, because mankind still cowered helplessly beneath the specter of constipation. Countless adverts announce their special cure for this dread disease. 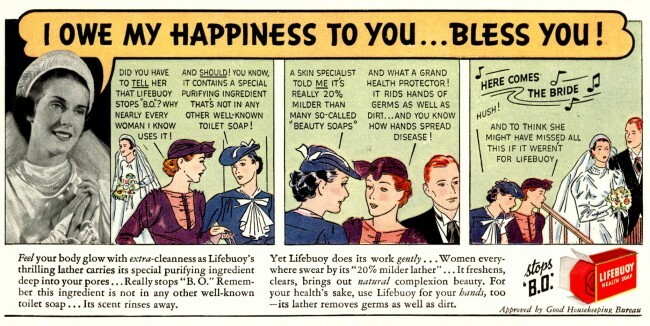 This bride literally would have died a miserable old maid had it not been for Lifebuoy soap. Evidently, her fiancé was so disgusted by her rank smell he was about to call off the wedding – until her friend introduced her to the World of Soap. A close call – but it does make one wonder what other basic hygiene tools our young bride has yet to discover. This advert is from ten years later (1947) – The War is over, Western Nation economies are on the rise, and all is right with the world… but the women still smell horrible. Let’s take this ad step by step: Here we have a newly married couple who are attending a party. Unfortunately, the young bride is shaming her husband by her amazing level of body odor. Yes, honey, you may as well purchase a one-way bus ticket out of town. Ted will explain that you “had an accident”. Indeed, with the neighbors whispering about your incredible funk, your job as wife is an abject failure….. but wait, what’s this? It seems Ted just happens to have in his possession a bar of soap. 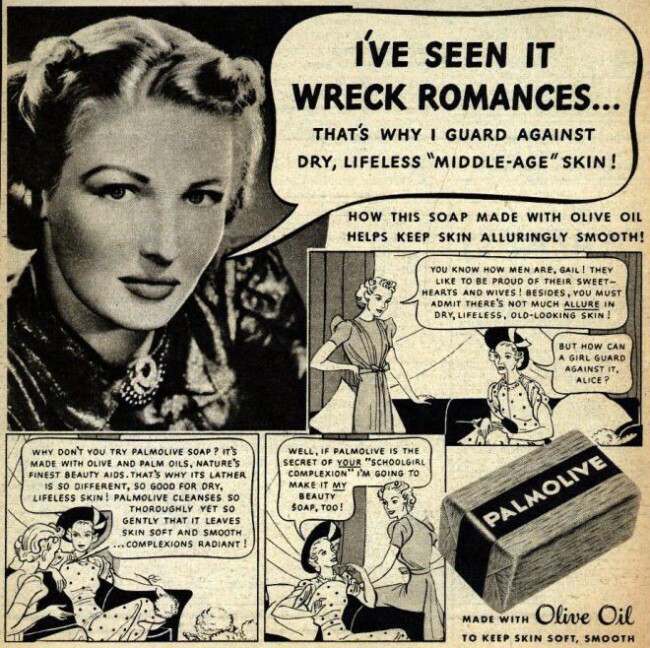 And, of course, the miracle of soap once again saves a marriage, and possibly a life…. but not before we get to see Ted’s wife naked. As usual, soap is sold to guard against shaming the godlike husbands. In this case, the woman’s repugnant smell isn’t the issue, it’s her disgusting skin. Back then, that was grounds for a husband to literally put his wife out to pasture. 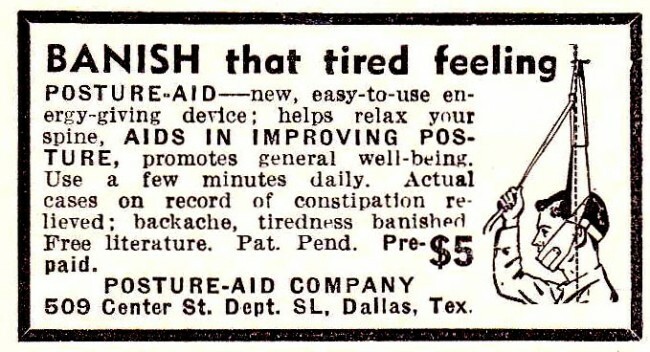 “Actual cases on record of constipation relieved” – and all it requires is for you to garrote yourself in the most foolish way possible. Personally, I’d choose bran flakes cereal over this spectacle of degradation… but that’s just me. I know constipation is a bummer – God knows it can put a damper on a day. 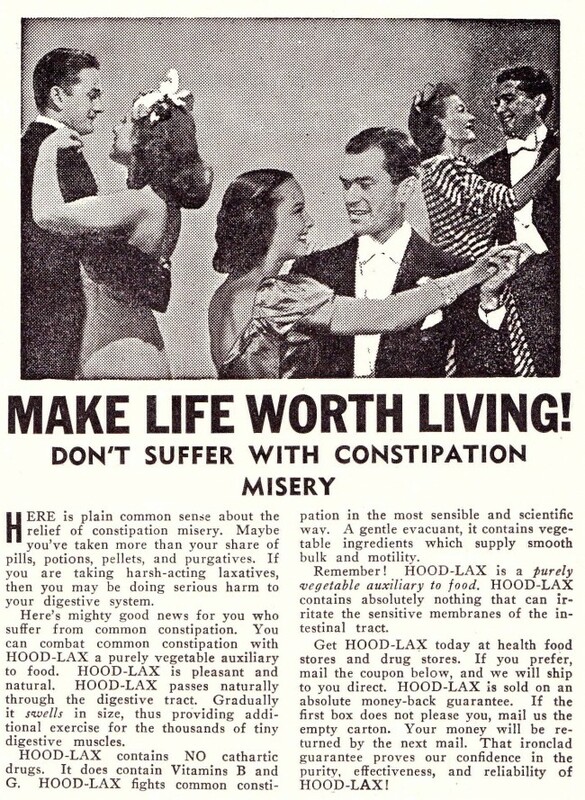 That being said, if your constipation is causing the sort of misery where life isn’t worth living, you’ve got a very special constipation indeed. I don’t know what HOOD-LAX is, but it sounds potent. Might I suggest some late night Mexican food and a frothy pint of HOOD-LAX and make life worth living! From devastated to cheerfully building a wall within two hours – that’s pretty damn impressive. I understand it’s not exactly fun to wake up constipated, but she seems clinically depressed – “the world’s all wrong” she exclaims. I wonder if that Sal Hepatica not only helps loosen the stool, but also has a little “happy sauce” in the ingredients as well. Either that or this chick is bi-polar. Are you noticing a pattern here with the constipation symptoms? It’s not annoyance at abdominal pain, it’s depression. 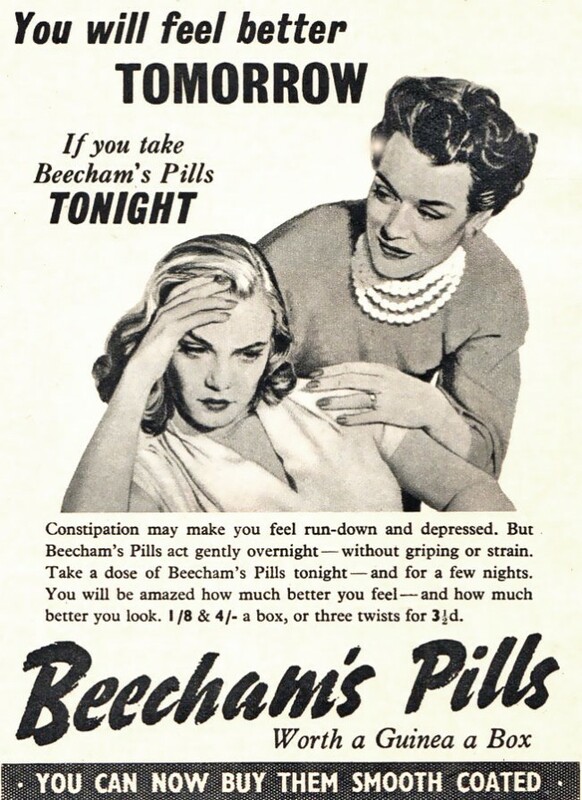 Clearly, there was something else going on here in women that was erroneously being blamed on constipation. Any armchair sociologists out there who’d like to posit a theory? I’d love to hear it.